I've made no secret of the fact that I am a church-going Christian so I make no apologies for this vaguely religious picture I'm posting today. For years I have organised the Easter egg hunt which concludes our celebration service on Easter Sunday. The children race round our ancient building hunting for eggs which they collect together ready for sharing out at the end of the hunt. This ensures even tiny people get a fair share! 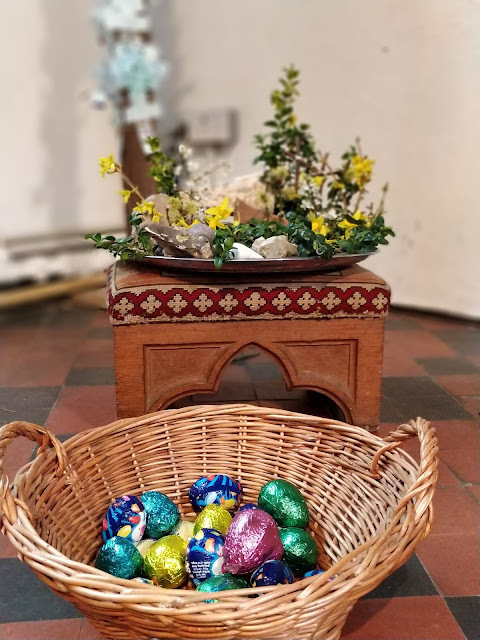 The leafy arrangement in the picture is our Easter garden which, if you look closely, includes a tiny tomb complete with stone, ready to be rolled away today. Behind this is a large wooden cross - you can only see the bottom part in this photograph. It has been decorated for this special day with prayers. Whatever your faith or beliefs I hope you have an amazing and happy Easter Sunday filled with the joy the day deserves. If you don't I pray that this day of new life marks a new start for you and those you love. Such a perfect Easter photo - a bit of everything. Hope you had a good weekend.